Crown Oil Partners IV LP. 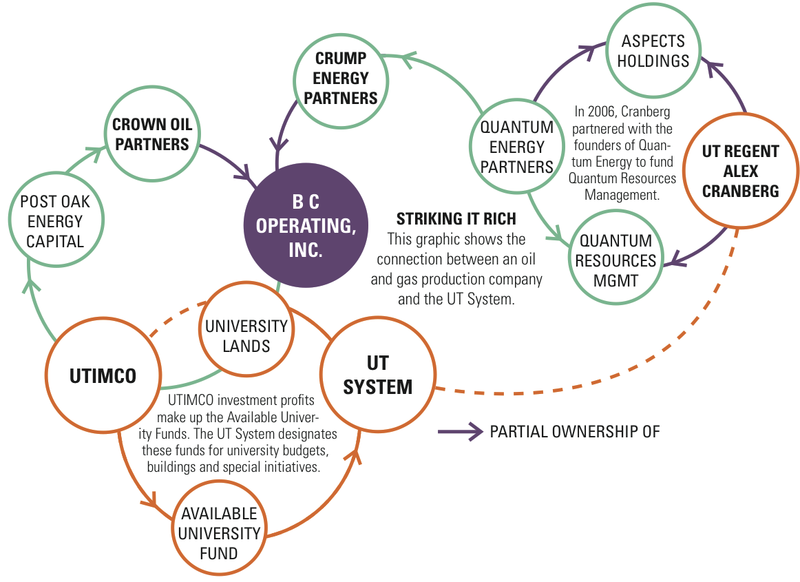 In 2011, the University of Texas Investment Management Company committed $200 million to a private investment firm that has a financial stake in an oil and gas production company that operates on University land — B C Operating Inc. Cranberg, an energy investor, is chairman of a holding company that is partially owned by another investor with a financial stake in B C Operating. UT System spokeswoman Jenny LaCoste-Caputo said UTIMCO CEO Bruce Zimmerman confirmed UTIMCO is aware of the connection to B C Operating, but it presents no investment conflict. UTIMCO’s $200 million commitment was to Post Oak Energy Capital, a private investment firm. Post Oak then committed $60 million to oil and gas company Crown Oil Partners IV, LP. The owner of Crown Oil owns half of B C Operating. B C Operating drills on part of the 2.1 million acres of land that make up the Permanent University Fund and has transferred ownership of some of its leases to Crown Oil. UTIMCO, a nonprofit corporation established by the System, invests profits from leasing the land for projects ranging from oil and gas production to cattle herding. Through the Available University Fund, the UT System receives two-thirds of profits from those investments and the Texas A&M University System receives one-third. UT-Austin received $200 million from the fund, which made up about 9 percent of the University’s 2012-2013 operating budget. B C Operating is a long-time University land lease owner, with records of oil production dating back to the 1950s, according to University Lands Office records. Through the lease sales, B C Operating has contributed more than $921,000 to the Permanent University Fund, not including production royalties. Post Oak was two years old when it entered a limited partnership with UTIMCO. Limited partnerships are one of multiple investment arrangements UTIMCO makes. Warner said Post Oak presented an opportunity to create a private equity partnership with a smaller, middle-market company that invests specifically in the energy sectors. Warner said UTIMCO’s portfolio had a gap that Post Oak’s market could fill. Cranberg, appointed by Gov. Rick Perry to the UT System Board of Regents in 2011, is connected to Crump Energy Partners, whose owner also owns the other half of B C Operating. Like Crown Oil, Crump Energy has partial ownership of some land leases originally obtained by B C Operating from University Lands. Crump Energy received a $100 million commitment from energy equity company Quantum Energy Partners. In a statement to The Daily Texan, Cranberg said Quantum Energy Partners owns 11 percent of his company, Aspect Holdings. Aspect Holdings, a private exploration and energy investment company, is also an investment portfolio company for Quantum Energy Partners, according to Quantum Energy. However, Cranberg said he does not receive any compensation from Quantum Energy Partners. Quantum Energy continues to have a financial stake in Aspect Holdings. Cranberg also has other connections to the founders of Quantum Energy through the creation of a hybrid investment fund and an oil and gas operating company called Quantum Resources Management, but it does not have investments in B C Operating or its affiliated companies. The UT System recently laid out a new disclosure system to avoid conflicts of interest by requiring faculty, administrators and staff who serve on boards of other organizations or participate in businesses beyond their university to disclose their involvement. LaCoste-Caputo said this policy does not apply to the regents because they are governed by state conflict of interest laws. As a regent, Cranberg is required to file a personal financial statement with the Texas Ethics Commission, which was obtained by The Daily Texan. But the financial statements do not require public officials to report who has financial ties to their businesses. Published on March 8, 2013 as "Web of investments".